Wonga's Six Month Personal Loans Land In South African Marketplace. Wonga South Africa is excited to announce that it now offers personal loans for periods of anything up to six months. Whether your loan term is four days, six months, or anything in between, the maximum amount you can borrow is still R4000 for first-time customers and R8000 for existing customers. What Are The Repayments On Wonga Personal Loans? If your loan term is two months or longer, then you will not make the single repayment at the end of the term normally associated with payday loans. Instead, you will make a repayment at the end of each month. If you borrow R4000 for one month, then including interest and fees, you make a single repayment of R4735 at the end of the term. If you borrow R4000 for two months, then the total amount you need to repay is R4837.21, and you would pay this in two monthly installments of R2418.60. 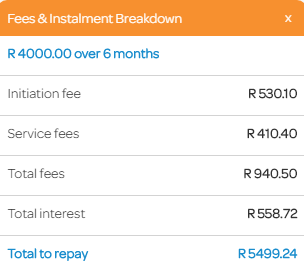 If you borrow R4000 for four months, then the total amount you need to repay is R5112.14 and you would pay this in four monthly installments of R1278.03. If you borrow R4000 for six months, then the total amount you need to repay is R5500, and you would pay this in six monthly installments of R900. Wonga’s six-month personal loans avoid the need to be tied into a loan for a year or more, as is the case with many personal loans offered by banks and other traditional providers. How Do I Apply For A Wonga Personal Loan? The process of applying for a six-month loan with Wonga is every bit as easy as applying for a shorter-term payday loan. Wonga encourages customers to pay off their six-month personal loans early if they have the means to do so. Doing so allows you to reduce the amount you pay in fees and interest. However, not all lenders allow early repayment, and some impose charges when this occurs, so if you are borrowing via another lender, ensure you check the situation regarding early repayment before committing. As with any form of borrowing, you should not take out a personal loan unless you are confident you can make the required repayments on time. Making late payments will incur charges and will damage your credit rating.